If you’ve been in an auto accident, it can be tough to know who you can trust to fix your vehicle. Call Autobahn Collision Center in Torrance for repairs that are completed by experienced technicians who will make your vehicle look as good as it did before the accident and safe to drive again. Collision repair. From minor fender bender repairs to front end rebuilds and everything in between, Autobahn Collision Center is your one-stop collision repair shop. Paint. Whether you want to paint your entire vehicle or a single panel needs some touching up, we can help. Paintless dent removal. Using new technology and skill, our techs can help remove or reduce the number of dents on your car without having to repaint. Frame repairs and straightening. Our frame repair specialists can help transform even the most badly damaged frames back into their original straight and safe shape. Full vehicle restorations. Was your car totalled but you don’t want to get rid of it? Do you have a classic car that you need help resurrecting? Give us a call — we would love to discuss the project with you! No one else in the area has the experience or skills that we do, so please give us a call whenever you need reliable collision repair that you can count on. 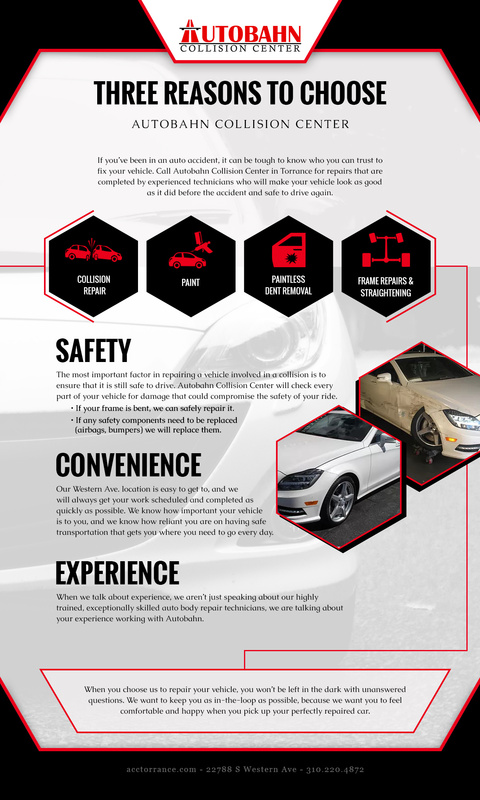 Read on to learn more about three big reasons that choosing Autobahn Collision Center is always the right idea. The most important factor of repairing a vehicle involved in a collision is to ensure that it is still safe to drive. Autobahn Collision Center will check every part of your vehicle for damage that could compromise the safety of your ride. If your frame is bent, we can safely repair it. Our frame rack allows us to straighten the frames of vehicles as small as cars and as big as semis. Returning your frame to its original shape is vital to ensuring that your ride is comfortable and safe. If any safety components need to be replaced (airbags, bumpers) we will replace them. Our Western Ave. location is easy to get to, and we will always get your work scheduled and completed as quickly as possible. We know how important your vehicle is to you and we know how reliant you are on having safe, reliable transportation, which is why we always have enough techs working to handle everything that our shop takes on. 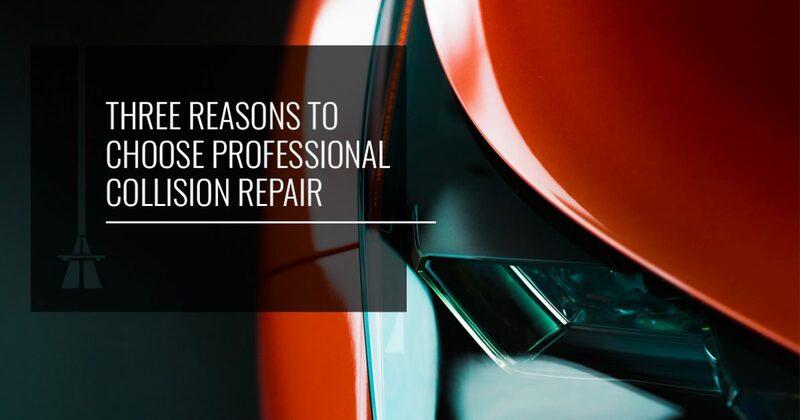 When we talk about experience, we aren’t just speaking about our highly trained, exceptionally skilled auto body repair technicians, we are talking about your experience working with Autobahn. When you choose us to repair your vehicle, you won’t be left in the dark with unanswered questions. We want to keep you as in-the-loop as possible because we want you to feel comfortable and happy when you pick up your perfectly repaired car. Trying to handle dealing with an insurance company and a shop can sometimes be difficult, which is why we do everything we can to alleviate some of that stress when you bring your vehicle into our shop. Contact us today if you need collision repair and automotive restoration services that you can count on to be completed on time. All of us are dedicated to helping restore your vehicle back to the shape it was in before an accident (or even better shape) and we make it happen by utilizing the latest technology and experience refined by years of practice. Contact us today to learn more about our shop or to set up an estimate.